Tomato plants are easy to grow in the vegetable garden or in containers in a location that receives several hours of sun. 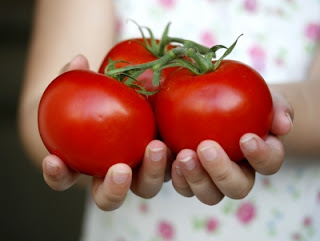 You will get tomatoes in a location with difficult soil and a few hours of sun, but the quality and quantity will be less than a spot with richer soil and more sun. On my property, I have many trees, and rocky soil. But by adding some composted soil to our rocky soil, I have successfully grown healthy tomatoes. The roots of the tomato plant tend to stay close to the surface of the soil, and though the plants tolerate dry soil to a degree, it is best to keep the soil somewhat moist between rain showers and storms. This is especially true for tomatoes planted in containers. As for feeding, my plants are fed about every two weeks. I have only started plants from seeds once, it's hard to do if you don't have a sunny location or grow lights to keep them happy. This is why I like to give my local garden shop some business by purchasing young tomato plants. I have thought of making a very small "greenhouse" like structure...more like a frame covered in heavy plastic, to cover and protect plants that I start from seeds on the sunny deck...time will tell if this project is ever done. We are at about 900 feet in Northern NJ and planting season lasts from mid-may to mid-September, or a little later if we have a mild fall. I harvest all of the remaining tomatoes at the end of the season, even if green, and put the green tomatoes in a brown paper bag to ripen, which they do fairly quickly if they are mature enough. In only a few months gardening can begin! I can't wait. Today I would like to add Gardening to the categories that we have in the right margin, because it truly can be a restful experience. For some, just working in the soil is relaxing, whether it be in a flower bed or vegetable garden, or a container garden like the one that I have on my deck. Some may not think of the actual planting as relaxing, but may find pleasure and relaxation just looking at gardens that have been cultivated by others. Whichever you prefer, I hope you enjoy the new theme, new pages and posts will be added as the days go by. 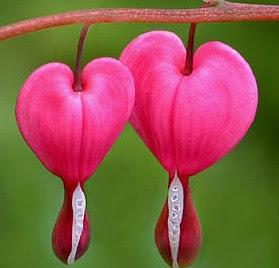 To start, in keeping with the fact that this month is the month of love and Valentine's Day, I have created a page about Heart Shaped Flowers. I hope you enjoy, and will visit the "Gardening" theme to the right occasionally to see what new posts and articles have been added. If you live in a cold climate and are looking forward to Spring, we only have a month to go, and a couple to a few months until we can really get our hands into the soil. I can't wait! that I obtained it from is no longer available.